FeesMustFall: Student Revolt, Decolonisation and Governance in South Africa dissects the influence of the days of the 2015 student that shook the government and would be repeated in 2016. The book’s reflections represent a snapshot in time, reflecting on a segment of the overall revolt and its impact. In convening the voices to write this book, we at the Wits School of Governance argued that the 2015-2016 voices of revolt deserve scholarly and activist exploration, even while the longer-term impact continues to unfold. The analysis ends in mid-2016, as disillusionment with the implementation of the early gains of #FeesMustFall set in, as rumours of a second cycle of revolt solidified, and as government and university managements worked to persuade a politically diverse (although by now confident in their abilities) student generation that more profound change was on the way. As we know by now, towards the end of September, the 2016 phase is unfolding – and the 2015 insights help us understand the ongoing anger and frustration. This volume shows that scholar ‘versus’ activist is not binary. Instead, the author-contributors cover a continuum. At the poles are the fully-engaged activists and the theory-driven scholars. At various intermediary points are the student activist-intellectuals, the student activist-scholars, scholar-activists, activist intellectuals, sympathetic or engaged scholars, technocrat-scholars and critical scholars. As the chapters of this book reveal, supported by accompanying brief biographies, there is no disengaged ‘neutral’ academia in this project. This book represents a tentative step towards recognising that knowledge is generated in multiple forms, and we willingly take the steps to expose our knowledge to scrutiny and critique by emerging scholars who are graduating at the ‘University of Resistance and Revolt.’We forefront students’ primary voices, and let them relate the narratives of what the students did to power in South Africa. This collection of voices within a broad, flat structure and diverse movement speaks the issues and reflects the contradictions of the time. In their writings, this book’s student and activist authors reveal, with no holds barred, how coloniality, race, patriarchy, structural and physical violence alienate, colour and continue to taint life in South African society and its universities. The students write, or co-write with workers, their lived experiences in the section that contains the core narratives on ‘The roots of the revolution’. Students Sizwe Mpofu-Walsh (Chapter 3), Omhle Ntshingila (Chapter 4, in conversation with workers Richard Ndebele and Virginia Monageng), activist-academic Gillian Godsell with student Kgotsi Chikane (Chapter 2), and in Chapter 5 with students Refiloe Lepere, Swankie Mofoko and Ayabonga Nase bring the texture of the struggles and the gaping holes in the 1994 ‘rainbow’ into the heart of political praxis and the student revolt.The primary voices illustrate arguments in the section ‘Power redefined – what happened to governance?’ and in Susan Booysen’s Chapter 1. This chapter shows how the students moved to change governance. It unpacks how the revolt extracted concessions from government on zero per cent increases in fees and free education, but then lost impact as the gains entered the conventional government passages of budgeting, commissions of inquiry and piecemeal implementation. 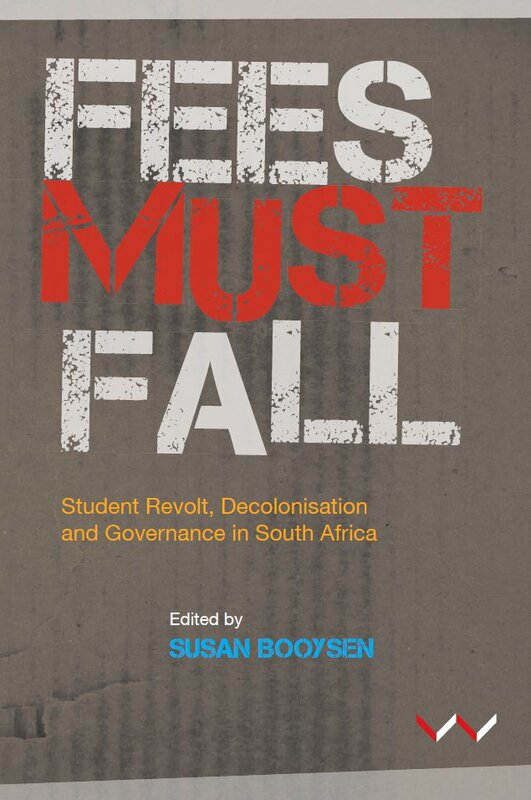 The chapter highlights both the #FeesMustFall movement’s ambiguous ideological and political coherence with the ANC government, and how the student revolt constituted a type of social revolution. The section ‘Rising against the liberators – South Africa in Africa’ deepens the dissection of the revolt and its impact on governance. It positions first the 2015-2016 student struggles in historical perspective in South Africa (David Everatt, Chapter 6), taking stock of how the emerging generations of the children of liberation are positioning themselves politically. The chapter argues that in the midst of the #FeesMustFall ferment the non-racial and multi-class unity of the early phase was ‘replaced with an essentialist African discourse that repeated selective Frantz Fanon and Steve Biko quotes, alongside selected elements of American critical race theory…’Lynn Hewlett, Horácio Zandamela, Koffi Kouakou and Gugu Mukadah (Chapter 7) analyse sub-Saharan Africa’s student struggles over time, taking stock of how students influenced on politics, policy and governance in Anglophone, Francophone and Lusophone Africa. The chapter demonstrates how the student struggles helped to propel change on significant political, governance and socioeconomic issues and shaped political consciousness – but failed to bring in political orders that differed fundamentally from the objects of the students’ initial revolt. William Gumede extends the analysis into Arabophone Africa (Chapter 8), and interprets the Arab Spring’s lessons for uprisings. With the South African context of gradually-accumulating frustration and anger the chapter suggests that comparable turns on government are a distinct future possibility. The section ‘Power and class redefined’ starts with Patrick Bond’s broad perspective on the fees struggle, interrogating its neoliberal framing (Chapter 9). Bond reveals many of the thrusts of government’s budgetary choices, especially budgetary reallocations to advance a middle-class project. Bond cautions that ‘the danger remains that once the heat of battle subsides the students will retreat to a relatively class-privileged position instead of pursuing this historic challenge of economic justice’. While #FeesMustFall registered the demands for no fee increases, decommodified education, an end to outsourcing and decolonisation on the national agenda, various narratives had come to the fore reducing #FMF exclusively to the agency of students – portraying #FMF as post-class, identity assertions related to black consciousness and inter-generational shifts. Vishwas Satgar (Chapter 10) argues that such narratives fail to locate the anti-capitalism of #FMF and deny the existence of solidarities and alliances at work within #FMF. He highlights the intersections of class, race and gender among outsourced workers and shows how working class agency translated into solidarities with students and progressive academics before and during #FMF. Patrick Fitzgerald and Oliver Seale (Chapter 11) argue that by 2015 crucial political authority wielded by the broader African National Congress (ANC) party structures outside of the campus environment had significantly waned – students had less deference to the ANC when it came to acceptance of ANC student fee directives handed to university managements. Pundy Pillay (Chapter 12) discusses the band of options existing for relatively free higher education. Pillay warns that unless the state significantly increases its funding again, for 2017, university managements will suffer shortfalls and will try to introduce fee increases – in a climate where #FMF rejects out of hand any increases at all. These chapters drive home the fact of the pincer grip in which the universities find themselves: unless their managements get additional massive transfers from the state (while they are fending off assaults on institutional-intellectual autonomy from the same state), they will enter destructive confrontations with both students and academic staff. The section ‘Justice, identity, force and rights’ explores the student struggles in the general context of the realisation and the abrogation of human rights. Darlene Miller (Chapter 13) asserts the significance of the gendered aspects of the student protests. She explores the feminism side of the student struggles, providing no-holds-barred insights into the powerful minds of the new generation of African student-activist feminists which stand in the context of key moments in the feminist positioning of the student struggles. Thad Metz’s analysis (Chapter 14) delves into the philosophical side of force and violence – from all angles: students, university managements and government – and contemplates the fine balances in adjudging what is fair and what is not. WSG will deposit all royalties earned through the sale of this book into a special WSG Royalty Beneficiary Fund. This fund will be applied for the benefit of a poor, under-funded and academically deserving student or students.